At previousTS-80, I wrote about ' high- resolution ' of TS-80 Triplet semi-apo. Today I want to write ' the Hue ' of TS-80 refractor. 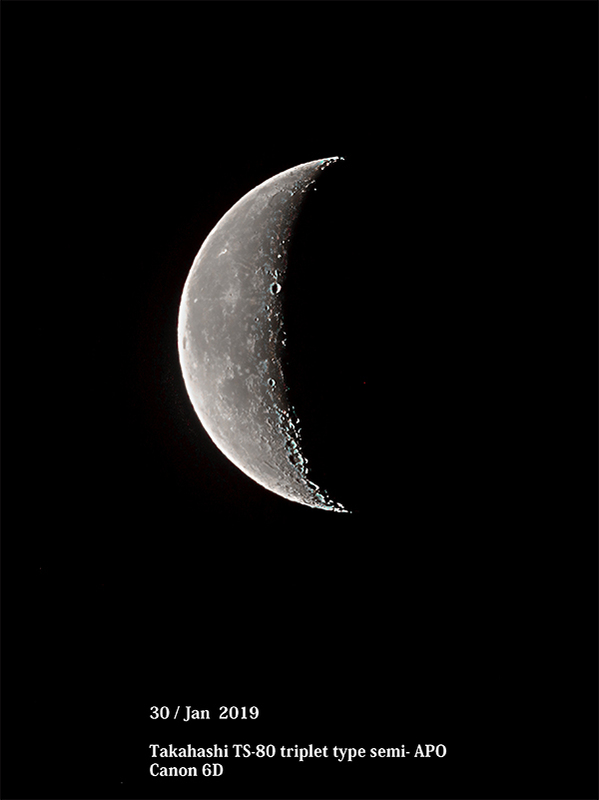 This image is close to real image when I watched the Moon by TS-80 with Takahashi Classic MC or 25mm eyepiece. ( Of course, not 100%. about 80% will be expressed . I think.). The color of the Moon by Takahashi TS-80 triplet type semi apo seems to be near to ( the image from Newtonian reflector).
' The color ' , If I say about only it, TS-80's vanity taste seems to be much diffrent from FC-76, FS-78 scope's it. ( * low magnification). If anything, close to the color of TSA-102, TOA 130 I have personally. Of course, the color aberration is not '0'., so when I raise magnification , ( a little) I felt color aberration. TS-80 refractor is telescope Takahashi released against ( Nikon 8cm F15 achromart, GOTO-kogaku 8cm F15 semi-apo). I know both of them ( Nikon 8cm F15 achromart, GOTO-kogaku 8cm F15 semi-apo). However, I think Takahashi's this refractor does not lose at all. Of course, ' it's vanity taste ' is much different from them ( Nikon 8cm F15, GOTO-kogaku 8cm F15 semi-apo). When watching this Moon , everyone will understand it. I think that anyone who bought this TS-80, will not complain this performance of this TS-80 Telescope. Also, Takahashi's sprint started in this time. ( TS-80 released in 1971 year).